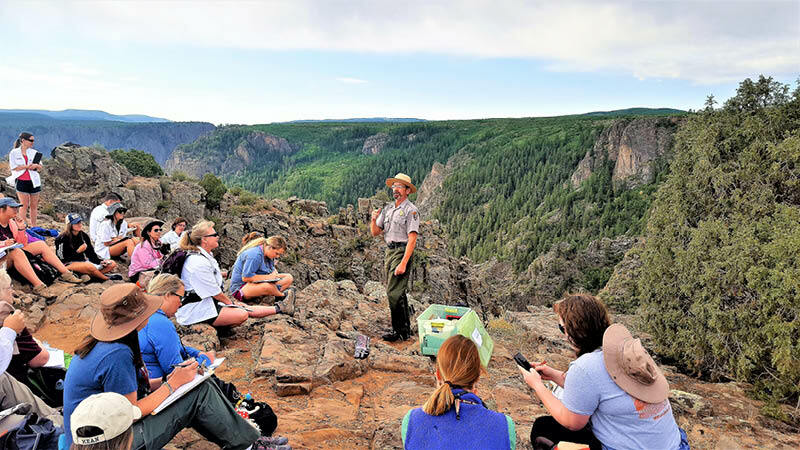 The teachers selected for the G-Camp field course experience spectacular geological locations, such as the Black Canyon of the Gunnison in Colorado, and learn from local experts like Supervisory Park Ranger, Paul Zaenger. Image credit: Thomas Smith. While taking 36 teachers out in the field each year to study geology may seem inconsequential in the overall scheme of educating our young people in the sciences, it clearly demonstrates the need and demand for such programmes. Since its inception ten years ago, the founders of G-Camp now receive twenty times the applications that they can fill. Dr. Rick Giardino, professor in the Department of Geology and Geophysics at Texas A&M University at College Station, Texas, helped start G-Camp. It has become internationally recognised, with the future of this and similar programmes gaining strength to educate more teachers and students in STEM subjects: science, technology, engineering and mathematics (STEM). In June 2018 I was lucky enough to be invited to spend several days at G-Camp, discovering what the students were learning and what they were taking back to their schools from the experience. Colorado National Monument: (1) View of Sentinel Spire and canyons; (2) Students are taught to observe; 3) Local Colorado teacher Kayla Jubert interviewed by Grand Junction TV. Image credit: Thomas Smith. Black Canyon of the Gunnison National Park: (1) Inspiring views; (2) More inspiring views; (3) Teachers feeling the moment at Dragon Point. Image credit: Thomas Smith. Colorado Rockies: (1) Home base in Colorado, the mining town of Ouray; (2) Teachers panning for precious metal at the Old 100 mine. Image credit: Thomas Smith. Rick has help along the way from local experts at specific locations and from the G-Camp staff. From left to right: Carolyn Schroeder, Nina Lawson, Fran Giardino, Rick Giardino, Kevin Gamache, Rita Gamache, and Merlin Lawson. Image credit: Thomas Smith. At a time when the Texas state government was trying different ways to attract more teachers into science programmes, Carlos Dengo of Exxon, one of Rick’s Texas A&M graduates, was also noticing that many students lacked science backgrounds. Consequently, Mr. Dengo offered Rick a proposal for an Exxon sponsorship to create a geological field programme for teachers. “I went right to work to put a geology field programme together that was designed for educators with little to no science background,” says Rick. “I had a very short time to get something started before the summer field season in Colorado and New Mexico. I put a request for interested teachers, along with programme details, on the internet in late April, 2008. By the time I checked the website later that week we had over 300 applicants. 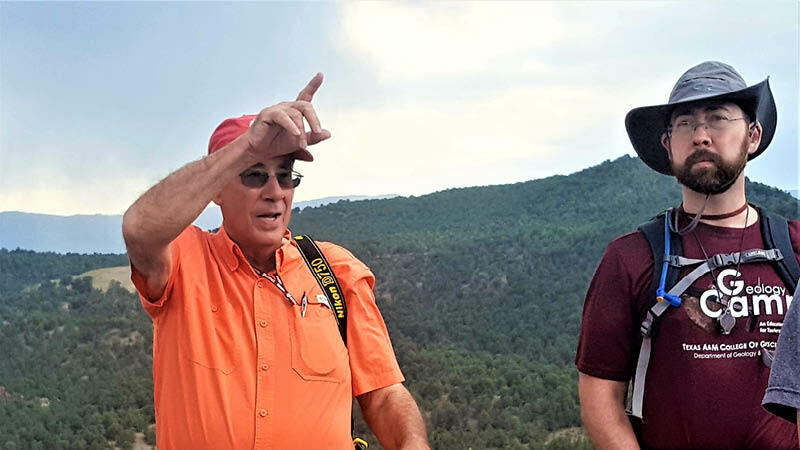 Dr. Rick Giardino pointing out features in the western Colorado foothills of the Rocky Mountains. “Each year we tour locations in Texas, New Mexico, and Colorado,” he explains. “The three-week trip can include Capulin Volcano, Great Sand Dunes, Black Canyon of the Gunnison, Carlsbad Caverns, various rivers, and the glacial valleys high in the Colorado Rockies. We keep the teachers busy with 12- hour days in an exhausting but exhilarating whirlwind of learning. They keep a daily field book and develop lesson plans each night. Post-trip, they present their knowledge and experiences to other teachers within their districts and at state and national meetings.” Image credit: Thomas Smith. “The first eight years we took only Texas educators,” he adds. “In 2016, we opened it up to ten people from outside the state and now it is open to the entire country; this year we had twenty from other states. The programme has been sustained by numerous industry sponsors, with Aramco the primary sponsor for the last two years. Moore says an experience like G-Camp gets educators out of the classroom and into the field to see, touch, and experience the subject matter first hand. 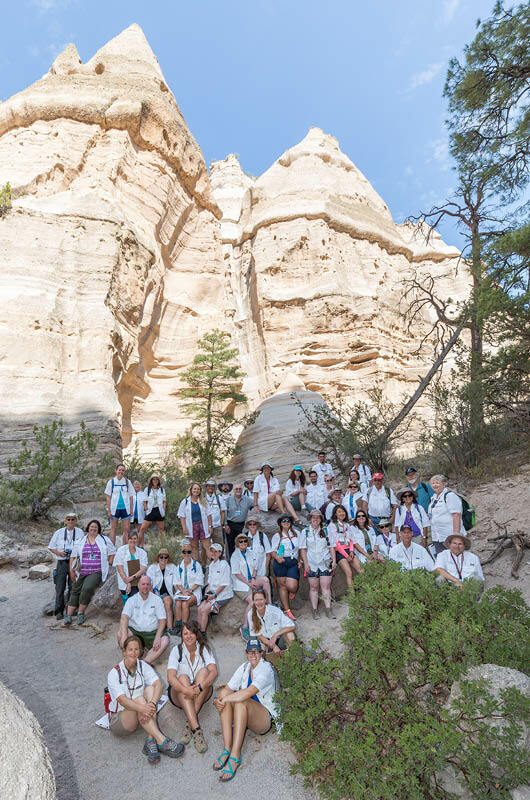 G-Camp group photo at Tent Rocks in the Kasha-Katuwe Tent Rocks National Monument in northcentral New Mexico. The tapering hoodoos were formed from a combination of pyroclastic flows, tuffs, and ash fall reworked by water. Image credit: Thomas Smith. Recent polls of US consumers show that a majority believe that the oil and gas industry is very important to our economy, but few want oil and gas companies in their communities. Fewer than 40% trust the industry to do the ‘right thing’ (EV polling, 2017). A majority of teens believe the industry is bad for society but would be “more likely to engage with oil and gas companies if they thought the industry was interested in their views” according to the EV polling. So where do programmes like G-Camp fit into the overall goals of oil and gas companies? According to Alma Kombargi, Director, Strategic Relations, Aramco Services Company: “The energy industry benefits are many. A programme like this supports a new generation of talent excited and interested in pursuing a career in the energy industry. Students learn that there is a wide range of geoscience careers and applications – such as geologists, geophysicists, or petroleum engineers. It widens their horizons and they begin to consider the possibilities.” She says G-Camp is an outgrowth of the company’s broader commitment to STEM education. While programmes like G-Camp may not change America’s overall perspective of the oil and gas industry, the 2018 programme changed the lives of the 36 educators and how they view the earth. Having worked as a field and petroleum geologist, I know the importance that first-hand field observations play in becoming knowledgeable and proficient in this science. Dr. Giardino and his assistants’ approach in teaching some of the many aspects of geology to a very diverse group was illuminating and gave me a great deal of respect for our educational system and the people that make it happen. It is these educators passing along their knowledge and enthusiasm for the sciences that will make a difference, one student at a time. Special thanks to Aramco Services Company and Rick and Fran Giardino for making my trip and this article possible. Some recommended GEO ExPro articles relating to, or similar in content to, education in the geosciences and creating excitement for science. Geoscientists do not seem to be able to inspire other people with enthusiasm for their subject. What can be done about this? Unconventional hydrocarbon volumes have taken the headlines recently – but how are these figures worked out and why are they so big?